Brass binnacle stand from the steamer Lafayette which sank in Lake Superior in 1905. 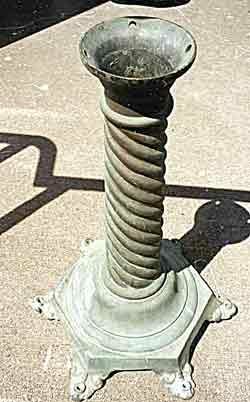 The holes in each of the feet allowed bolts to hold the binnacle to the floor of the pilot house, keeping it in place during voyages. The holes in the circular flange area at the top of the stand were used for bolts to hold the compass binnacle. The decorative design of the stand shows details that were found on ships built at the turn of the century. The compass binnacle was most likely lost during the severe storm that caused the shipwreck. It has not been seen since. The steamer Lafayette, a 454-foot 5,113 ton steel bulk freighter was rammed by its helpless towbarge, the 5,000 ton steel Manila, and blown ashore near Encampment Island in a severe gale on November 29, 1905. The helpless ship was thrown against the cliffs where it broke in half. The storm tore apart the forward section while the crew huddled in the rear end. The stern section of the ship was salvaged and later became part of another ship. The remaining wreckage was left scattered on the bottom and abandoned to the elements. Fifty years later, when scuba diving was beginning to become popular, a group of young divers from the Frigid Frogs dive club in Duluth found the location of the shipwreck. After diving in the calm, cold Lake Superior water on a summer day, they came across a decorative brass artifact in the scattered debris field. Participants in the transfer of the binnacle stand (center) were (l- r): Ms. Shelly Maloney of the Lake County Historical Society, Mr. Bob Anttila of San Diego CA, who returned the binnacle, Mr Steve Daniel of the Great Lakes Shipwreck Preservation Society, and Mr. Scott Anfinson of the Minnesota Historical Society. Ms. Ann Zastera (not shown), President of the Lake County Historical Society, was also present for the transfer. The binnacle will be housed in the pilot house of the Frontenac which is behind them. This object was about two feet tall with a rope-turned hollow shaft that was about five inches in diameter. The hexagon-shaped base was supported by six ornamental feet. They later found out that this unusual piece was the stand that held the compass binnacle in the pilot house of the Lafayette. Bob Anttila was the diver who found the binnacle in 1955. Following graduation from UMD in 1960, he joined the U.S. Navy and left Duluth. He and his wife, Maxine, took the binnacle with them during a 20-year active duty career that spanned both coasts and included Hawaii. Bob and Maxine have lived in San Diego since he retired in 1975 from active duty in the Navy and joined a business in the private sector. A Duluth High School reunion for classmates in the 1950’s was held in Duluth during the week of July 10, 2000. This event evoked a desire in Bob to bring the binnacle stand back to Minnesota where it could be enjoyed by many others in a museum setting. Inquiries to a couple of notable local museums revealed interest, but lack of space to display the artifact. The Great Lakes Shipwreck Preservation Society (GLSPS) was informed and offered to help find a suitable location for the binnacle stand. The GLSPS is a non-profit volunteer organization of scuba divers and historians who are interested in helping stabilize and preserve shipwrecks in the Great Lakes. Steve Daniel, Chairman of the Put-It-Back (PIB) Committee, contacted Bob Anttila and informed him of the GLSPS’ interest in helping him. Scott Anfinson at the Minnesota Historical Society (MHS) was contacted to consider accepting the binnacle stand as a donation on behalf of the State of Minnesota. The PIB Committee then proposed that the binnacle stand be loaned to the Lake County Historical Society afterwards for display in the Two Harbors Lighthouse Museum. This site was chosen due to its close proximity to the Lafayette shipwreck site near Encampment Island. 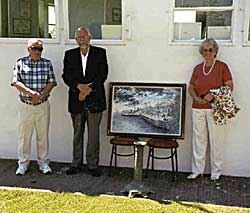 Mr. Ron Thureen, Bob Anttila and Mrs. Louise Thureen, LCHS Board member stand by a painting of the Lafayette by Doris Sampson. The painting was commissioned by Ron based on a photograph of the Lafayette taken at the time of the shipwreck. Shelly Maloney of the Lake County Historical Society (LCHS) was contacted by the GLSPS and enthusiastically agreed to accepting the loan of the compass binnacle stand for display in the Lighthouse Museum at Two Harbors. She informed the GLSPS that the society had recently received funding from the Coastal Management Program for developing a shipwreck display at the Lighthouse Museum. Bob Anttila brought the binnacle stand to Minnesota in a specially built wooden case. 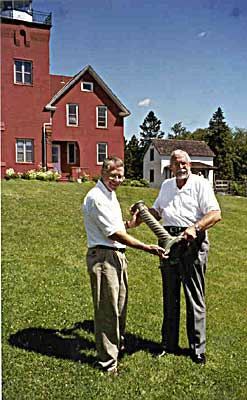 On July 13, 2000, he donated the binnacle stand to the state of Minnesota during an informal transfer in front of the pilot house of the Frontenac, a similar ore steamer from that period. Accepting the transfer on behalf of the state was Scott Anfinson of the MHS. Shelly Maloney, of the Lake County Historical Society, Ann Zastera, President of the LCHS and Louise Thureen, a board member of the LCHS, were on hand to accept the loan of the binnacle stand for the lighthouse museum shipwreck display. All expressed their appreciation for the return of this historic artifact. Other attendees included Maxine Anttila, Ron Thureen, Leroy Johnson, a friend of Bob’s and operator of the boat from which they dived the Lafayette shipwreck in 1955, Cheri Daniel and several interested lighthouse visitors. 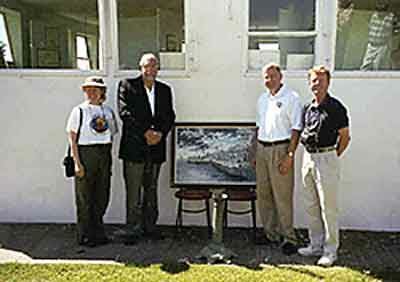 A large painting of the Lafayette shipwreck was displayed as a fitting backdrop for this occasion by Louise and Ron Thureen. Ron had commissioned Doris Sampson, a local artist, to create the painting based on a photograph taken on the day after the shipwreck. The Lafayette binnacle stand will be included in a shipwreck display inside the pilot house of the Frontenac next to the foghorn building on the grounds of the Two Harbors Lighthouse. 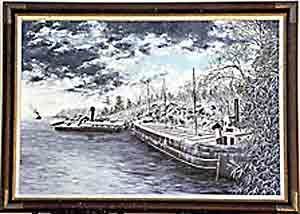 Photo of the painting of the shipwreck showing the stern section of the Lafayette next to the towbarge Manila. The tug Edna G is depicted in the distance steaming to rescue the crew. Painting is by Duluth artist Doris Sampson. Steve Daniel and Bob Anttila are surprised by the lightweight of the brass binnacle stand in front of the Two Harbors Lighthouse.